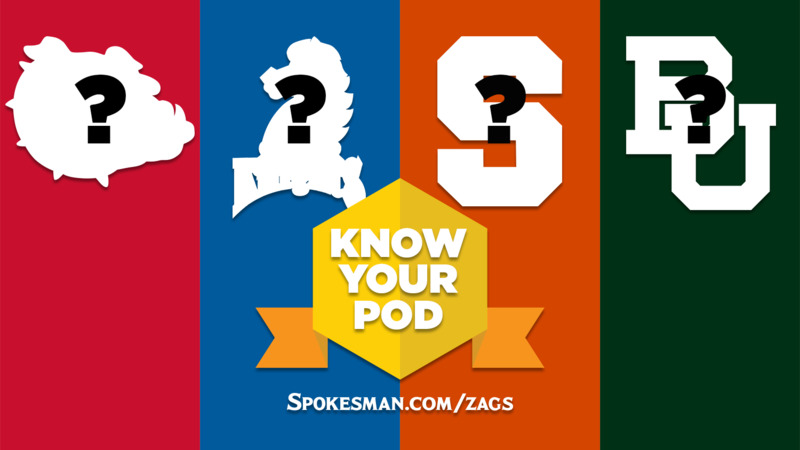 UPDATED: Tue., March 19, 2019, 8:11 p.m.
How well do you know Gonzaga’s pod in the NCAA Tournament West Regional? Take our 10-question pod quiz to find out. Q: Two of the following three celebrities have undergraduate degrees from Syracuse: Bob Costas, Jim Brown, Hilary Clinton. Which one does not? Q: Baylor is one of eight NCAA Division I basketball schools with “Bears” as a mascot. Name four of the other seven. Q: These three professional basketball players all went to school for teams in this pod. Who’s currently averaging more points in the NBA: Domantas Sabonis (Gonzaga, Pacers), Dion Waiters (Syracuse, Heat) or Taurean Prince (Baylor, Hawks)? Q: Gonzaga great John Stockton played 19 NBA seasons in the building that will host the Bulldogs on Thursday. Which two NBA career records does Stockton still hold? Q: Which famous “Seth” attended Farleigh Dickinson University: Seth Rogen, Seth Meyers or Seth Greenberg? Q: There are five teams from the state of Texas in this year’s NCAA Tournament field. Name them all. Q: Syracuse’s Jim Boeheim and Gonzaga’s Mark Few are among a select group of college coaches with at least 500 career wins. Which other coaches in this year’s tournament are part of the club? Q: Gonzaga’s first-round opponent, Fairleigh Dickinson, won its first-ever NCAA Tournament game on Tuesday. Who did the Bulldogs beat for the first-ever tournament win (Hint: 1999)? Q: Is the pod’s leading scorer (season average) Gonzaga’s Rui Hachimura, Fairleigh Dickinson’s Darnell Edge, Syracuse’s Tyus Battle or Baylor’s Tristan Clark? Q: One of these popular baseball movies was filmed in Salt Lake City: The Sandlot, The Rookie, Bad News Bears. Which was it? A: Mike Krzyzewski (Duke), Bill Self (Kansas), Roy Williams (North Carolina), John Beilein (Michigan), John Calipari (Kentucky), Rick Barnes (Tennessee), Kelvin Sampson (Houston), Tom Izzo (Michigan State), Leonard Hamilton (Florida State). Published: March 19, 2019, 8:05 p.m. Updated: March 19, 2019, 8:11 p.m.